and its contents will soon be replaced. The map at right shows the rough locations of RedPriest's upcoming concerts, but it doesn't give much indication of when. The list gives exact dates, and the "map" at the bottom of this page gives the details in a different way. This page is not definitive! Some of the listed items are not strictly for Red Priest, but might, for example, be a recorder workshop, or for Piers Adams and David Wright. You need to check the Red Priest home page for details and click on the "Concert Schedule" link at the top left. The postcodes below are generally approximate and should not be relied on. I've done my best, but their locations are for indication only. This "map" (provided you can read it!) shows both when and where these concerts will be. To use it, identify where you are on the map of the UK. That will give you a colour. Now look for a dot that's the same (or similar) colour, and at the same "height" as you. If you can find one, that is a concert near you, and the date is given by how far across you are. 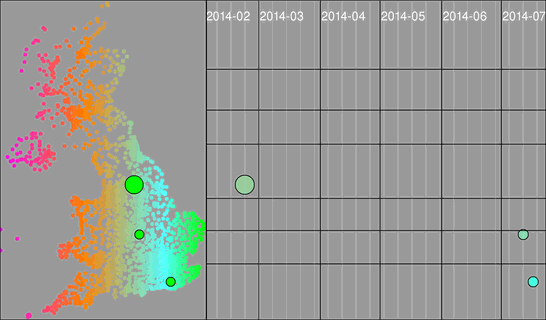 The green dot close to you on the UK map gives confirmation. Here is a selection of previous concerts. 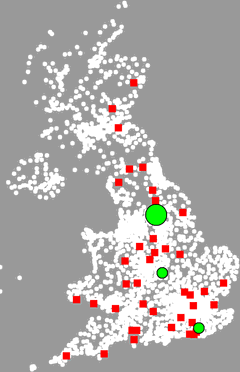 This list will be culled from time to time, but is here to put the red dots on the UK map above, showing past performances.